“Just think how the old Australia – the over-regulated, overprotected and inflation-prone Australia – would have coped with the global financial crisis a decade ago” gushed Tom Switzer of the Centre for Independent Studies in a recent column. Australia made the cover of a recent Economist, and George Megalogenis did a book and a TV series on it (I have critiqued Megalogenis’ claims before). The mantra has been relentless since 1983. That dreadful “old” Australia, presided over, we should remember, by that pinko Bob Menzies, achieved average annual GDP growth exceeding 5% and unemployment averaging a minuscule 1.3%. Nowadays such numbers are considered impossible, guaranteed to bring on raging inflation, but inflation averaged a moderate 3.3%. The contrast was documented over 20 years ago by Stephen Bell (Ungoverning the Economy, 1997). The post-1983 neoliberal economy has never come close to this performance, with GDP growth around 3%, unemployment rarely below 5% and inflation in the 2-3% range. Banks make most of their money by ‘loaning’ money. (They create the money they ‘loan’ with a few keystrokes, but that’s another story.) 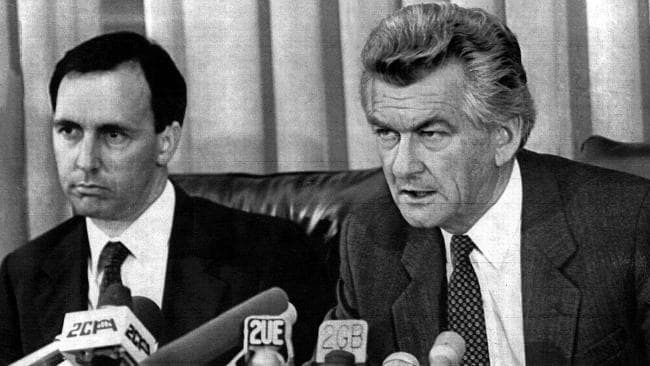 When the Hawke-Keating government deregulated Australia’s banks the banks competed to throw money at ‘entrepreneurs’ – people like Alan Bond and Christopher Skase. There was a huge run-up of private business debt. The economy boomed along with much cheering from the breathless commentariat. But then the debt bubble burst, precipitating the Keating recession of the early 1990s, the worst since the 1930s and a recession we did not have to have. Australia avoided a GFC recession because the Rudd-Swan Government, uniquely in the world, briefly suspended neoliberalism and spent directly into the economy. Yes the mining boom helped, but the short-term timing is clear. Christmas 2008 was gloomy everywhere but here.